David Ortiz taunted us. Not even on the baseball diamond or even about baseball. Big Papi taunted the Minnesota sports fan about basketball on Twitter. The former Twins first baseman/DH turned Boston Red Sox DH took time out of his feud with Tampa Bay Rays ace David Price to troll the seemingly helpless Minnesotan. Oh, how far we have fallen. As we open up June in the state of Minnesota, a couple storylines run wild amongst the rubes: how horrible Joe Mauer looks and what in the world is going to happen to Kevin Love. The faces of the Target Plaza franchises are currently the talking points and points that aren’t exactly good for them personally or for their current franchise. It’s been ten years since the Minnesota Timberwolves were in the NBA Playoffs. Never say never, but it will more than likely be a four or five year absence before the Minnesota Twins return to play in the MLB playoffs. Hell, the Vikings look to be in a rebuilding year, so we might as well throw that in here, too. This is our outlook. Our very Minnesotan piss poor outlook. We ignore the Golden Gophers winning the NIT tournament despite it being Richard Pitino’s first year as coach. We ignore Jerry Kill getting the Gophers back to bowl games and building back up what Tim Brewster tore to the ground. We ignore the fact that the Minnesota Wild won a playoff series, their first in ten years. We ignore the Minnesota Lynx who have been to the WNBA Finals three years in a row, won two of them if you hadn’t noticed, and are the only undefeated team in the association in 2014. Snap out of this crappy attitude people. It’s sports. The ball won’t always bounce your way if we want to be cliché, but there’s no reason to have this poor, poor pitiful me attitude about the sports teams in this state. Success ebbs and flows. Not that long ago, the Twins were winning division championships, the Timberwolves were making the playoffs every year and the Vikings had a boatload… of talent. The Wild will win a Stanley Cup sooner than later, they are way too young and talented not to. The Twins have Byron Buxton, Miguel Sano and a field of dreams of prospects coming up the pipeline that we lead this team to the playoffs again. Give it a couple years of fermentation and a couple years of Aaron Rodgers getting older, the Vikings will probably see the top of the NFC North soon enough. If the Timberwolves pull off the Kevin Love trade right, they should be setting themselves up for success sooner than later as well. Has it been a longer valley of defeat than most, God, I hope so, but let’s stop being an easy stomping ground for Big Papi slam tweets. It’s hard to imagine, but maybe one day the Twin Cities can steal the hashtag Ortiz used and claim themselves to be: #CitiesofChampions. As a Yankee fan, I am not happy with the Twins after this weekend 🙂 But I can truly say the Twins are an organization who continually rebuilds and makes so much out of what originally looked like so little. They are on the verge of doing it all over again with the minor leaguers you referenced. The Vikes are on the rebound as well. Head up. I live in Atlanta now, so if you want to talk about sports apathy, this city hangs on a Georgia Bulldogs title they won in 1980!! Nice work on this one. 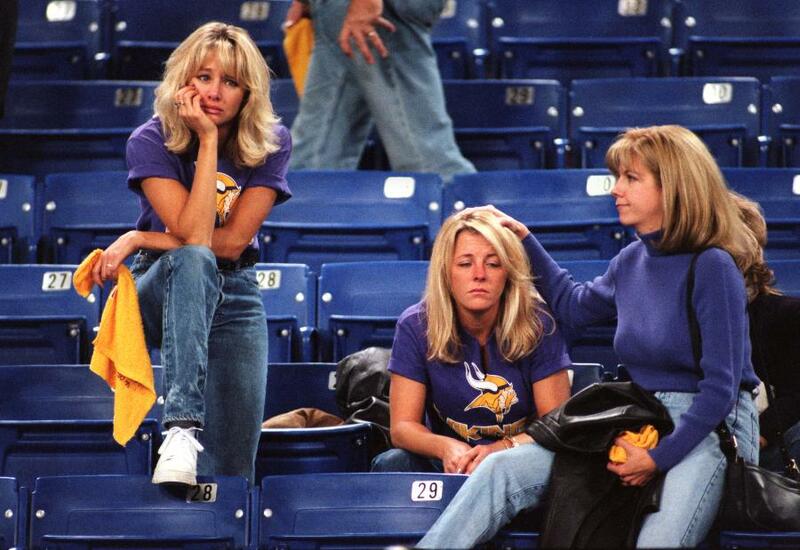 You see your true passion as a Minnesota fan!